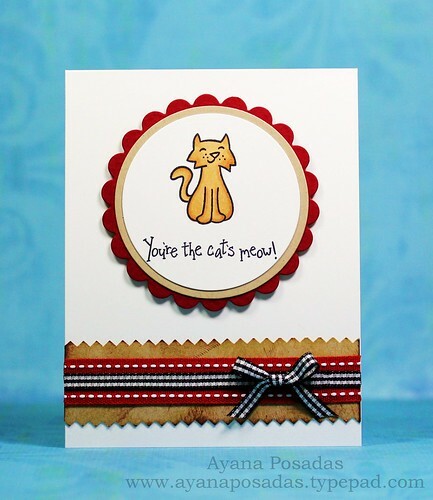 This first card, shown above, was inspired by THIS card that Kelly made. I tried to use the same sketch layout and colors of her original card. The only main element that I changed was the stamp images. For my second card, I chose to use THIS card for my inspiration. 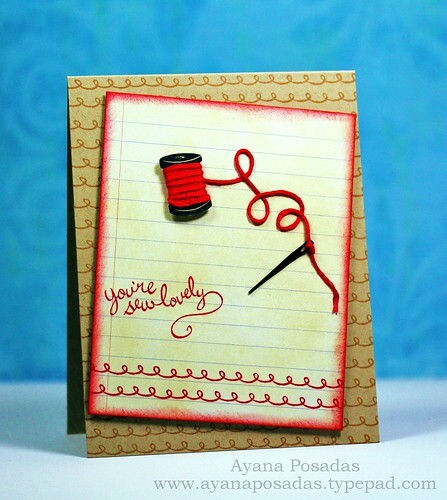 As you can see, Kelly's card was one-layer, however I chose to make my version a bit more 3D by adding some actual red thread on the spool and also by popping up the white layer of my card. Do you guys want to know a "secret"?.... Well, i'll tell ya... This is actually my FIRST card ever using digital stamps! Yup, that's right. I have always been hesitant about going digital, because at first, it kind of just confused me. Haha!... I'm not even sure why, because I do love computers! But I have to admit, when Tenia first sent me an email with the digital stamps for this challenge, my first initial thought was: "Umm... Okk... what am I supposed to do with these??"... HAHA! I know that may sound silly, being that digital stamps are so very popular now days. But I guess it was just something "unknown" to me, since I had never tried them before, and nobody has ever shown me how. LOL!.... But anyways, I am now happy to report that I had so much fun working with these digital stamps, and I realize now that they are surely not as "confusing" at all, as I once thought they were. I have no idea why I didn't try them out sooner! You can color them however you want, eliminate certain portions that you may not need at the moment, and you can also play around with their sizes. For this particular image that I used on my card today, the stamp originally had a sailboat and waves in the background. However, I chose to just feature the cute little sailor kids. So I simply got rid of the background and made the sailors bigger to the size I wanted them to be. I actually ended up making another card with the items in the background from the original image. But I will share that with you another time soon. I'm so glad I was able to be a part of this challenge and that it forced me to try something new! So I just wanted to say THANKS to Tenia and her fabulous design team! And to any of you readers who may also be hesitent about trying something new, I would just like to say "Just go for it! Try it out with no worries, and there's a good chance you'll be happy with the results."